Group photo of the participants at the 2015 Northwest Horn Symposium in Eugene, OR. Participants in the 46th International Horn Symposium stand on the steps of Prince Albert's Memorial. 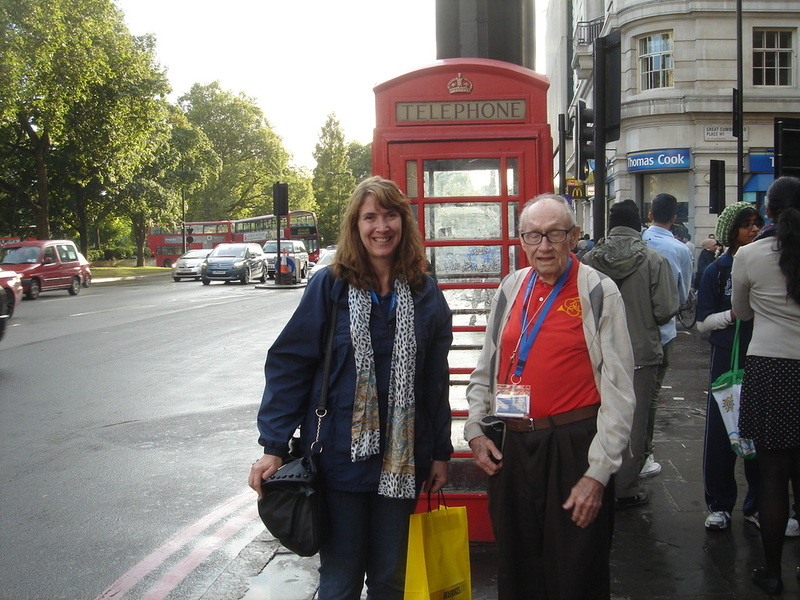 Jennifer Scriggins Brummett and Pete Exline in front of a phone booth. Gina Gillie has composed two new works that include horn. The first is a piece for horn and women's choir, "To Spring", that is taken from the last movement of Gillie's trio for soprano, horn and piano. In late April, Gina traveled to Portales, NM, as a guest artist to work with the choirs from Eastern New Mexico University and their director, Jason Paulk. The women’s choir premiered the arrangement of “To Spring” on their Spring Choral Concert. The second composition is a brass trio that was commissioned by Elliott Higgins for the New Mexico Brass Trio. It is a three movement work: "Fanfare and Chorale", "Lament" and "Tango". A live radio broadcast of the last two movement can be heard on the KING-FM Soundcloud. Copies of the music can be obtained by contacting Gina via email (gilliegc@plu.edu). Jeff Snedeker received two major awards in April. First, he received the 2014 Timm Ormsby Award for Faculty Citizenship, a statewide award created in 2013 to encourage, recognize, and honor exemplary civic engagement by faculty from each of the six public baccalaureates in Washington state. Second, Jeff was selected as the national winner of the 2014 Phi Kappa Phi Artist Award. First presented in 1983, the Phi Kappa Phi Artist Award recognizes the achievements of those who, in addition to their outstanding scholarship, have displayed talents in the broad realm of the arts—creative, graphic, performing, visual, and fine arts. The award is given once every two years. Phi Kappa Phi is the nation's oldest and most selective all-discipline honor society. The Society has chapters on more than 300 college and university campuses in North America and the Philippines. Its mission is "To recognize and promote academic excellence in all fields of higher education and to engage the community of scholars in service to others." The Northwest Horn Symposium 2014 was held from April 11-13, 2014 at Portland State University in Portland, OR and was hosted by Melissa Robinson. The featured guests were Roger Kaza, Principal Horn of the St. Louis Symphony, Brian Holmes, composer, physicist and horn performer, and local artist, John Cox, Principal Horn of the Oregon Symphony. Attendance throughout the weekend was approximately 150 students, professionals, teachers, vendors, enthusiasts and supporters. Group photo of the participants at the Northwest Horn Symposium 2014 in Portland, OR. IHS has a new method of sharing events throughout regions. Visit the IHS Northwest Horn Region Facebook page to find up-to-date announcements for events around the Pacific Northwest. Jeff Snedeker performing on a jazz set. Gina Gillie giving a lecture on singing and horn playing/teaching. Mike Simpson playing with the All-Star band. Mike was the winner of the Jazz Horn Competition. Lyric Brass releases new CD entitled "American Music for Brass Quintet"
PLU's Lyric Brass Quintet has just come out with a CD of American music that features the brass quintet. The project was made possible by two generous grants: The PLU Regency Advancement Award and the Co-Op Press Recording Assistance Grant. The CD is available on iTunes, Amazon, CDBaby and from Gina Gillie. Contact gilliegc@plu.edu. Gina Gillie's "To the Seasons" for soprano voice, horn and piano is now published. The composition is published through RM Williams publishing. Contact music@rmwilliamspublishing.com or visit www.rmwpublishing.com/gillie-to-the-seasons. To hear sound recordings of the piece, visit this website. 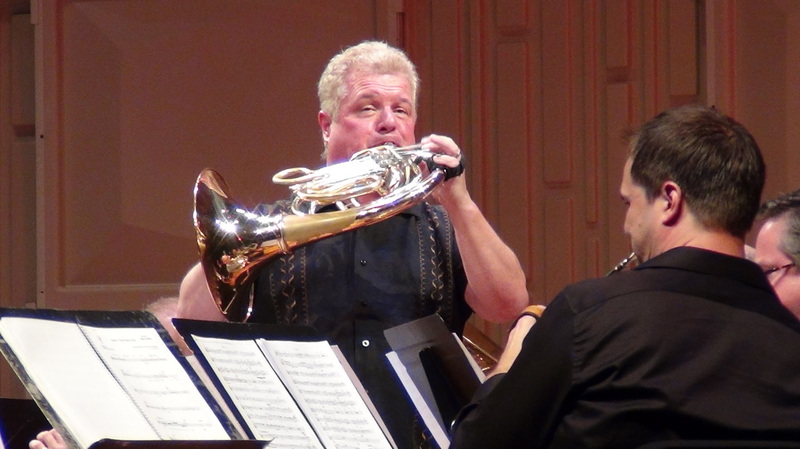 Next year's horn symposium will be hosted by Sherry Linnerooth at Montana State University in Bozeman, MT, and will feature guest artists Eric Ruske and Michael Robert Thornton. The dates are scheduled for April 19-21, 2013. Sherry can be contacted at sherry@bozemansymphony.org. Check the Symposium website for more information. 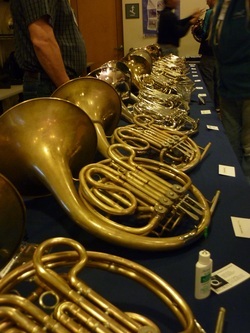 Northwest Horn Symposium 2012 was a great success! The most recent NW horn symposium, March 30-April 1, was held at Pacific Lutheran University and was hosted by Gina Gillie. The featured artists included Douglas Hill and Mark Robbins. Douglas Hill shared his expertise regarding teaching, learning and extended techniques, while Mark Robbins brought his experience as an orchestral and solo player to the discussion. Mark Robbins and Lydia Van Dreel also led two warm-up sessions during the weekend. The Washington Music Educators Association selected Jeff Snedeker as Higher Education Music Educator of the Year for 2011. Congratulations, Dr. Snedeker!! Website for Northwest Horn Symposium 2012! The website for the Northwest Horn Symposium is up and running! 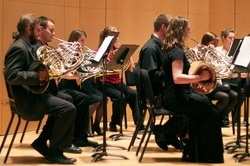 Visit www.plu.edu/music/northwest-horn-symposium to find more information and to download the registration form. Online proposal forms for performances and presentations are coming soon. Employment to begin in September 2012. Final auditions for this position will be held in Seattle on Monday, January 9, 2012. Preliminary auditions may begin as early as Tuesday, January 3, 2012. Please send a brief resume listing recent orchestral experience, musical education and audition experience placement by Monday, November 14, 2011. Repertoire will be sent upon receipt of your resume. • Benefits include medical and dental insurance, pension, disability, life insurance, instrument insurance, and parking. (Please include the words “Principal Horn Auditions” in the title of your reply, and attach your resume as a Word document or PDF). Seattle Symphony is an Equal Opportunity Employer. 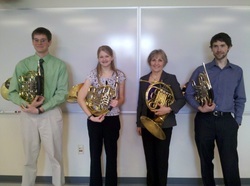 The Northwest Horn Symposium for 2012 will be hosted by Dr. Gina Gillie at Pacific Lutheran University in Tacoma. The featured guests will be Douglas Hill, Bernhard Scully and Mark Robbins. Plan ahead to participate with these great masters. A website will be coming soon for information and registration. The 43rd annual symposium was hosted by Wendell Rider in San Francisco, CA at San Francisco State University. Many master classes, presentations, vendors, concerts, and other learning and playing opportunities were experienced by all. The next symposium will be hosted by Bill Scharnberg in Denton, TX, May 15-19, 2012. The Central Washington University Horn Choir performing in San Francisco. Directed by Jeff Snedeker. 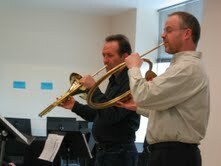 A very successful Northwest Horn Symposium was held on April 8-10 at CWU, hosted by Jeffrey Snedeker. Thank you to all of the featured guests and participants for such an enriching weekend! Photo courtesy of Laurie Heidt. Andrew Clark gave a presentation on early horns. Here he is with his assistant from the audience, who made astute observations regarding the instruments. It also appears that a cymbal rack can double as a holder for a baroque horn. 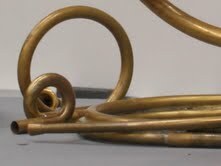 A close up of some crooks and couplers for a natural horn. The International Horn Competition of America 2011 will be held August 31- September 4 at the University of Louisville School of Music in Louisville, KY. Included in this event is a clinic with IHCA adjudicators, which will center on a discussion concerning pertinent aspects of solo performing, a wonderful opportunity to hear from some of the most experienced performers, teachers and adjudicators in the horn world. For more information, visit www.ihcamerica.org. Jeffrey Snedeker just released two CDs, both available from him directly for $15 each, or on Amazon and iTunes. The Contemporary Natural Horn-- the first of its kind, recital music for natural horn from the last 40 years. Minor Returns: Tributes to the Horn in Jazz-- my second jazz CD, featuring special guest Tom Varner, and a number of CWU faculty, alums and students. The tunes include tributes to Julius Watkins, John Graas, David Amram, and others. Gail Williams gave a Master class at Gonzaga University in the end of March. Pictured with her in this photo are Steven Munson, Cassidy Young and Ian McLean.